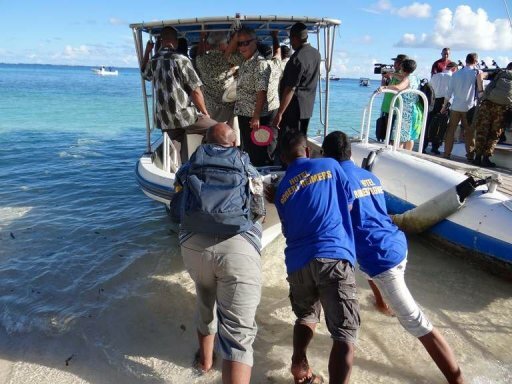 Staff push a boat used to transport Pacific Islands Forum leaders from Eneko Island on September 5, 2013. A new Pacific regional pact calling for aggressive action to combat climate change has achieved a “major accomplishment” by gaining US support, officials said Sunday. MAJURO, Marshall Islands (AFP) – (AFP) – A new Pacific regional pact calling for aggressive action to combat climate change has achieved a “major accomplishment” by gaining US support, officials said Sunday. The Majuro Declaration, endorsed by the 15-nation Pacific Islands Forum (PIF) at their summit last week, contains specific pledges on cutting greenhouse gas emissions. The PIF nations, some of which are barely a metre (three feet) above sea level and risk being swamped by rising waters, have since received wide support led by the United States after presenting the document to more than two dozen countries at a post-forum dialogue. US Interior Secretary Sally Jewell announced during the session a new climate change fund for Pacific islands vulnerable to rising sea levels. “Climate change is the defining challenge of our time,” she said in launching the Pacific-American fund. Separately, the US was offering $24 million over five years for projects in “vulnerable coastal communities” in the Pacific, she said. Marshall Islands minister Tony de Brum said the US support was a “major accomplishment”. The European Union, Britain, France, Indonesia, South Korea, Thailand and Malaysia also expressed support for the declaration. “The Majuro declaration is something we very much welcome,” British Minister of State Hugo Swire said. The Majuro Declaration is to be presented to UN Secretary General Ban Ki-moon during the opening of the General Assembly later this month.